I’ve been home for several days and one of the first things I noticed is how much music there is to go through, edit, mix and master before we can even think about releasing KlezFactor: Europa into the world. We have around 5 1/2 hours of audio and video recordings to wade through, from our live show in Dresden (which Christian Betz recorded professionally in audio and video formats), the recording session in Dresden and the live show in Prague. While we’re going through everything and getting Europa ready for a 2016 release, we’re going to keep you entertained by releasing audio and video that isn’t going to appear on the album along the way. Keep in mind that it really depends on how quickly we can work on the audio: most of it is in multitrack recordings that need to be mixed and edited a bit (or a lot) before we can post it. The first result that we’ve got ready for release is a curious thing that we performed for the first time in Prague. We were lucky to be joined by my good friend Ondrej Galuska, a member of the Czech band, eggnoise, as well as a terrific solo musician as well. I’ve been a fan of eggnoise ever since I met Ondrej and we exchanged music after being roommates at an academic conference in Montreal, around 2007 or 2008. I heard eggnoise’s album “Albumen” and I was hooked to their creative, progressive pop-jazz-electronic fusion that still makes me giddy! In 2009, I happened to be in Europe and Ondrej invited me to Prague to record a little bit for eggnoise’s next album, Yolk. The band ended up using my clarinet on a couple of tracks but I was really struck by a tune on the completed album that I heard for the first time when I received it in the mail. “Gubbinal” was a funky, electro-tinged tune that had a chord progression that sounded a lot like the first section of “The Golem of Bathurst Manor.” Set to a dark poem by Wallace Stevens, Gubbinal hooked me immediately. 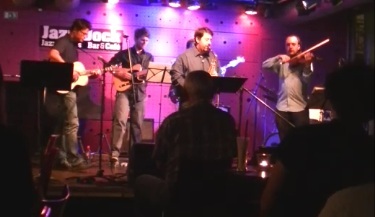 When KlezFactor was coming to Prague and inviting Ondrej to perform with us, I had the idea of combining the two tunes into a little medley. Ondrej prepared to sing Gubbinal in the same key as The Golem of Bathurst Manor and he taught the song to the band during our brief set up and sound check before the concert. The result, if you ask me, is something truly special. The gifted musicians of KlezFactor plus a really cool song, morphing into a piece of our own. Next → Next post: Europa Update!